Burgos is a city of about 175,000 people located in the heart of the Burgos Province, in Castilla y León, Spain. Burgos is located 240km to the north of Madrid and 160km to the south of Bilbao and Santander. It is on the plateau of Castile and its average altitude is 856m. Burgos is best known for its Cathedral , that forms part of the UNESCO World Heritage, and for being a town of the French Route in the Way of St.James . Also it has an interesting old quarter, some ancient religious buildings, a lot of green parks and in July 2010 was opened The Museum of Human Evolution. Burgos-Villafria airport  was opened in 2008 with daily flights to Barcelona. If possible fly to Paris-Orly and Palma de Mallorca in the weekends. Air Nostrum, an Iberia-affiliated airline, also has flights from Burgos to Albacete, Ibiza, Bolonia, Nice, and London (all via Barcelona). There you can take a taxi or a bus (L25) that costs 0.85€. Other major airports near Burgos are Madrid (240 km), Bilbao (160 km), Santander (160 km) and Valladolid (125km). There are several connections by train or bus between these cities and Burgos. If you are arriving Madrid you can take a bus in the Intercambiador of Avenida de America or a train in Chamartin railway station, the trip takes less than 3h. Burgos Rosa de Lima is the name of the railway station of the city. Is located at Avenida Príncipe de Asturias s/n,Tel. :902-240202, it´s 24h open and you can buy tickets there from 7:15 am to 10:30pm or online in Renfe web . It´s 5km far away from the city center but there are buses and taxis you can take. Burgos Rosa de Lima railway station offers high speed connections (Alvia) with Barcelona, Bilbao, Hendaya, Gijón, Madrid or Vigo. Also it has connections with other nacional (like Salamanca, León, Vitoria, San Sebastián...) and international cities (Lisbon, Coimbra and Paris). Burgos is well connected by bus to many other cities in Northern Spain, and taking the bus is often faster than taking the train. The bus station is in the center of the city, next to Plaza vega in the Calle Miranda nº4-6, Tel. :+34 947 265565. You can download schedules of national an international services . Taking a bus is the best option if you want to travel to Madrid, there are several coaches during the day and the trip takes only 2h 45min, the company who travel to Madrid is Alsa , you can buy tickets online. Burgos has a privileged location between the centre and the north of Spain. Several roads cross the city and it´s easy to arrive Burgos by car. From Santander take the main road N623 and 627 or the A231 and A67 divided highway. From Madrid take the A-1 divided highway. From Zaragoza and Cataluña take the AP-68 motorway at Miranda de Ebro take the AP-1 motorway. From Portugal and Valladolid take the A-62 divided highway. From France and the Basque Country take the AP-1 motorway. From Galicia and Leon take the A-231 divided highway. There are also car rental facilities in the city. Wailking is the best option to visit the main attractions of the city, but there are some places of interest you can take public transportation or rent a bike to get there. Bicycle is a good option for visiting all atractions of the city. Burgos has a very good bicycle lane that connects several points of the town. Also there is a public rent service for bikes called bicibur . Riding a bicycle in Burgos is a good activity, there are no big slopes and riding along the rivers or in Fuentes Blancas are very interesting activities. Official taxis are white, and have a reddish stripe on the front door. The tariff is displayed on top of the car (a 1 during daytime, a 2 during the night, which become 2 and 3 on holidays such as Christmas Eve). You can take taxis in the taxi ranks all around the city , also you can call in advance +34 947 277777 or +34 947 481010. Transportation by private car in Burgos is not difficult. Altough looking for a place to park in the city center can be very time consuming unless you park in private parkings. Though not known as a tourist destination, Burgos is most well-known for its Cathedral, a stop along the Camino de Santiago and a UNESCO World Heritage Site. Within the cathedral is the tomb of the Spanish hero El Cid. You can also see the Saint Mary's arch near it. Not very far you will find lots of churches, like San Nicolás, San Gil or San Lesmes. You can also visit La casa del cordón, which was the residence of the Catholic Kings in Castille. The Monaterio de las Huelgas Reales is also a good place to visit in Burgos. Morcilla, or blood sausage, from Burgos has a reputation for being the best in Spain. It is a black pudding made mainly with pork blood, onions, spices and rice. You can order it as a tapa with bread or eat it in various stews. Pilgrim Meals or Menu del Dia, are advertised and available in most restaurants. Three course meals; First Course choice of salad, soup or pasta. Second Course choice of chicken, beef, pork or fish with potatoes accompanying it. Third course dessert choice of a custard, fruit, ice cream, yogurt or cake. Usually includes wine and bread. But one should ask to be sure. Hotel Rice, Avda. Reyes Católicos 30, ES-9001, Tel. +34 947 222 300, Fax. +34 947 223 550 , . Four star hotel. Hotel Cordon, La Puebla, 6, Burgos, 09004, Tel. +34947265000 . 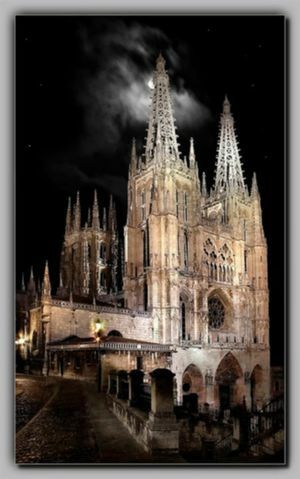 Located in the center of Burgos, only a couple of minutes away from the Cathedral and the Museum of Evolution and right next door to the historical House of the Cordon. NH Palacio de la Merced, Calle de la Merced, 13, +34.94.7479900 . The hotel is located in the heart of the city, on the banks of the River Arlanzón, overlooking the Cathedral, the Arco de Santa María and the Paseo del Espolón. Hotel Norte y Londres, Plaza Alonso Martinez,10, 09003, Burgos. Tel +34 947 26 41 25  Founded in 1904 and the oldest of all Posadas del Camino de Santiago. The hotel is located conveniently in the heart of the city close to shops, cafes and restaurants. The Camino de Santigo pilgrim path passes directly in front of the hotel. Spain's extensive bus system makes it easy to take day trips from Burgos to other northern Spanish cities. Fun trips include Bilbao, Santander, Soria, Logrono, Madrid, Valladolid, and San Sebastian. This page was last edited on 14 February 2016, at 00:41.